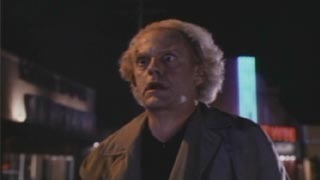 Originally when Doc, Marty, and Jennifer arrived in the year 2015, a hovercycle was to cross their paths before the taxi was. Terry: Lightning struck that thing, 60 years ago [Marty: Yeah I know], November 12, 1955 I always remember that day do you know why? Because this old buzzard tried to shaft me outta 300 bucks for fixing his car. 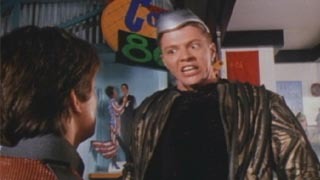 Biff: Oh Shut Up Terry! Terry: The car was filled with manure Biff, manure. I am a mechanic, I'm not some kind of stable boy! 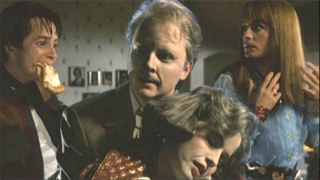 Biff: Ah! You're livin in the past Terry! Marty Sr: Hello. What the hell is this? Marty Sr: Yeah. That's better, Damn Kids. Hey son, watchin a little TV for a change? Is that my Mom? Is that my Mom? 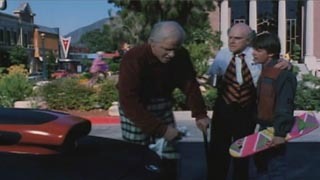 Marty Sr: Dad, what the hell happened, You throw your back out again? George: Oh, I was out on the golf course. Marty Sr: C'mon Dad, I told you to watch that backswing. Lorraine: No, he was hit by a car it just fell out of the sky, he could have been killed. George: And I was 2 under Par. Lorraine: I don't know what this world is coming to. Marty, how was work? Marty Sr: I'm tellin ya that big promotion is right around the corner. Anyway, I'm starving let's eat. Come on son, let's go, it's dinner time. Marty Jr: Dad, I'm watching these programs. Marty Sr: Mister, we aet at the dinner table when your grandparents are here, put your damn glasses on, huh? Marty Jr: Dad, I can only watch two shows at once on these things. Marty Sr: Yeah, you kids really got it rough, when I was your age, I wanted to watch two shows at once, I had to put two sets next to each other. 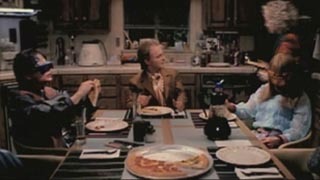 Marty Sr: Oh Boy, Oh Boy Mom, you sure can hydrate a pizza. I'm sorry I missed that whole thing. Lorraine: Well, I think it would be nice if we threw a little party. Marty Sr: Now Mom, before we throw anymore parties for Uncle Joey, let's wait and see if he makes parole. Lorraine: George, will you rotate your axis, it's not good for your digestion if you eat while you're inverted. Marty Sr: Uh Marlene, honey pass the kelp. Marlene: No, I don't want to so nub off! Lorraine: Marlene, don't talk to your father that way. Marlene: Grandma I'm on the phone. Marty Jr: I'd like some tea please. Marlene: Look I'm gonna have to call you back. Marty Sr: Damn It! Marlene! Pass the damn kelp of tea! Lorraine: Why isn't she home yet? Marty Sr: I'm not sure where Jennifer is Mom, should have been home hours ago but I'm havin a hard time keepin track of her these days, she's in one of those moods again or something. Marty Jr: Fruit Please, Thank You! 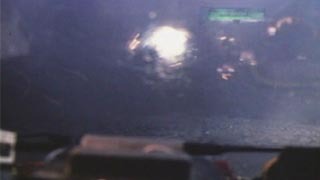 This is a scene that was cut from the film. 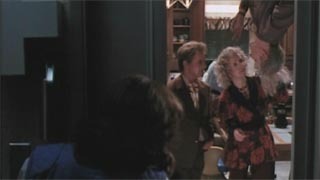 It is shown right before Marty talks with Needles, it shows Jennifer watching while Marty fixes his double-knotted tie. Lorraine: But it says You're Fired. Doc: Come On Einie. Einie! [Whistling]. Come on boy we're goin home, inside, inside, get in there. 3-D: And don't ever come beggin for drinks in here again, you friggin lush. Dave: Can't you guys take a joke? Dave: Marty! What's happenin bro? Say, your're lookin kinda ragged, did you sleep in your clothes again last night? 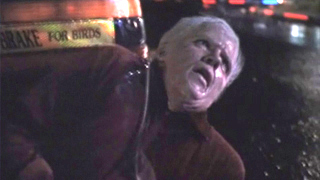 Marty: Dave, Dave my god what happened to you? What happened to the town, what hell is goin on here? Dave: So when did you get back? Marty: Back? Back from where? Dave: Well, if you don't know, I don't know, say let's go have a drink. 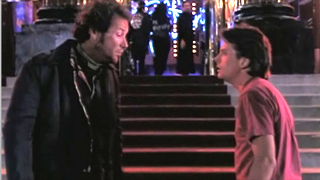 Marty: Dave, I gotta find Mom and Dad? Dave: Dad? You gotta find Dad? What's the matter with you anyway? And since when are you and Mom on speakin terms again? Marty: Speakin Terms...Where is she Dave? Tell me where I can find Mom? Dave: Same place as usual I guess...in there! 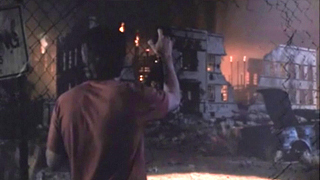 The pronunciation by Doc in this scene was originally supposed to be different. It was to be delivered more quickly than that which was seen on screen.